Are you an aspirant hunting for a job in Government sector after your retirement? Are you a candidate looking for a job in the banking sector and lies below the age of 65 with a huge number of work experiences? Here is a great opportunity for you given by the Central Bank of India for the post of director in Bhopal. There is various condition laid by the Central Bank of India. When you are interested in the job you may check for the official notification for various qualifications expected. It is completely offline application and you need to download them and submit on the given time. Make sure you are submitting all the required documents in the mentioned format. Also, the application reaches there on 15th April 2019. If there is any delay in reaching the application, it may not be considered valid and it will not be evaluated. 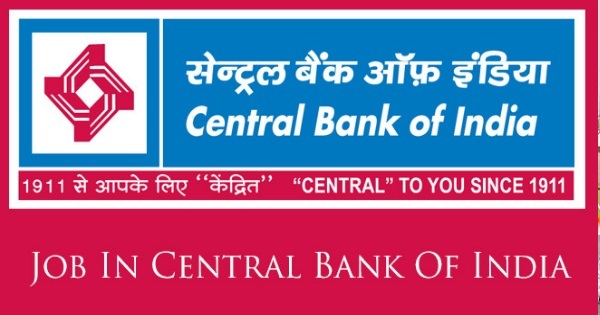 Be updated with the official website for further information regarding the job and also for the upcoming vacancies in the Central Bank of India. Officers with rural development background like Agriculture Finance Officer/ Rural Development Officer/ Agriculture Officers converted to Mainstream of banking/ Lead District Managers and Faculty leaders/ Faculty members of Training Centers/ Colleges with Specialization in Rural Development etc. shall be preferred. 1. The candidates should have 20 years of service and retired by a VRS or by attaining superannuation with the minimum of 15 years of service in Officer Cadre. 2. The candidate should have worked as the Branch Manager in any scale in a rural branch for a minimum of 03 years OR as Agriculture Finance Officer (AFO) in a Rural Branch for the time of 03 years. 6. Should be resident of the same state it is also more preferred when it is the same or nearby districts. Step 2: Open careers and click on an official notification, read the notification completely. Look for the eligibility and necessary documents that have to be attached. Step 3: If you are eligible and interested to apply for the job you may download the job application form and fill the required details in it. Attach all the important documents that have to be attached in the mentioned format. Step 4: Make sure you submit all the documents to reach the office on the 15th of April 2019. In case of any delay in the submission, your application will not be considered valid.